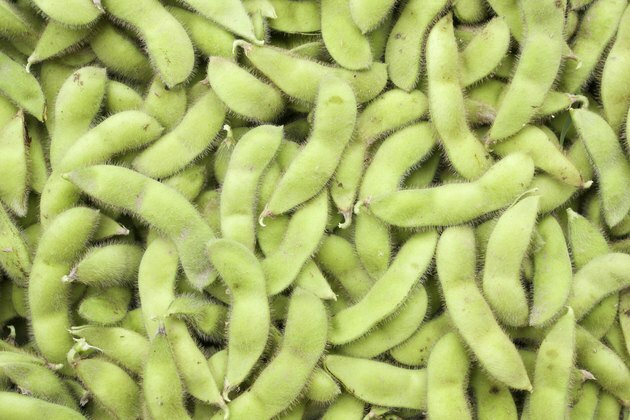 Edamame is the immature seed pod of the soybean plant. The plant can be grown as a perennial in U.S. Department of Agriculture plant hardiness zones 7 to 10, but it is commonly grown as an annual in colder climates. It grows in a bush form to about 2 feet in height. Soybean is tolerant of a wide range of soil types, as long as they are well-drained, and it actually grows best when soil fertility is low. It prefers sunny locations, and although it needs consistently moist soil, it does not do well in wet climates. The snow pea is a variety of the garden pea (Pisum sativum); peas are annuals, grown throughout USDA zones 2 through 11. It has a vining growth habit and can reach a length of 2 to 7 feet. Like soybeans and other peas, it prefers sunny locations and well-drained soil; unlike soybeans, however, it does well in fertile soil. 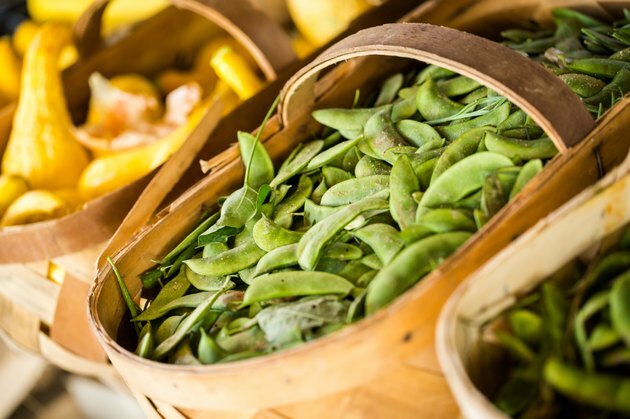 Snow peas are a cool-season crop, which means that they fare best when daytime temperatures are relatively low, generally in the range of 55 to 65 degrees Fahrenheit. Because of this, peas are usually planted early in the season, often even before the danger of frost has passed, so that they have time to produce before temperatures get too warm; temperatures above 86 degrees F can have an adverse affect on the plant's production. They may also be planted again in the late season as temperatures begin to cool, for a fall harvest. Soybeans, in contrast, are a warm-season crop, which means they require warmer temperatures and must be planted later. They do best when summers are hot, with a mean July temperature between 60 and 64 degrees F.
The bright green seed pods of the soybean and the snow pea are similar in appearance, but the soybean pod is fuzzier than that of the snow pea. 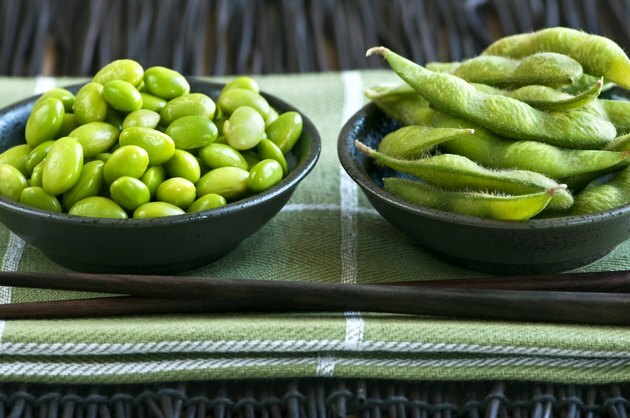 Soybeans pods are not edible, so the immature seeds must be removed before they are eaten, although edamame is often boiled and served in the pod. Snow pea pods do not possess the difficult-to-digest fibers that make the pods of other types of garden peas inedible, so the entire snow pea pod is edible. The pods are typically harvested when they're immature, so the peas inside are usually underdeveloped and tender. 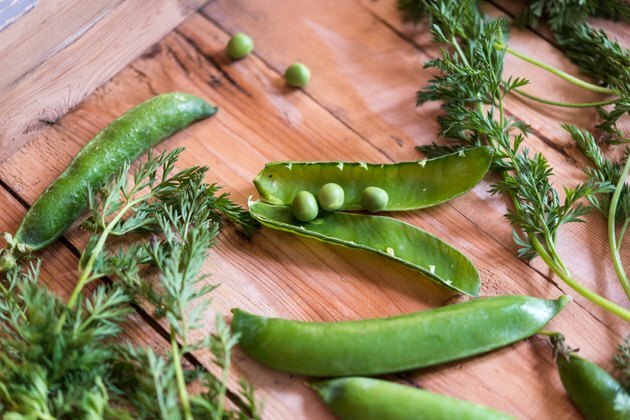 What Is the Difference Between Snow Peas & Snap Peas?